I merged Qweaver's thread into this thread. You southren boys should know this one. Southern Red Oak?? Doesn't it come in a five lobed leaf variety as well? I will defer to some other southern or even northern boys . I'll defer to doctorb, since he answered correctly. The good doctor has southern genes in there some where. 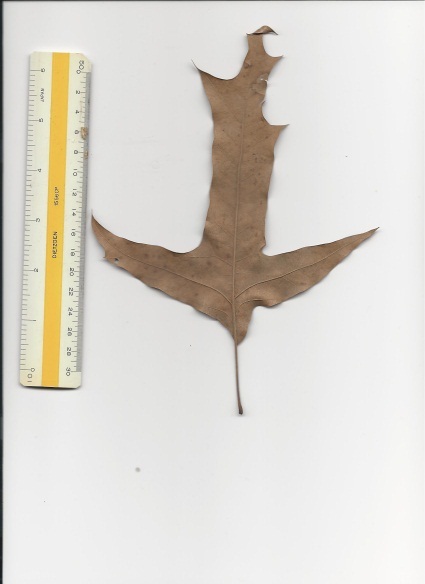 Yep, that leaf looks curiously similar to a turkey oak leaf, but the long petiole gives it away! 2. But now I've got to research both the turkey oak and the petiole, as I haven't a clue about either. Ah, doc, we will have you enrolled in forestry classes before long. Then it will be corks, tin pants, plaid shirts, and a double bit ax on your shoulder. I'm thinking Doc's looking forward to a trip to his camp about now. I hate to be a dissenter, but I believe that it is what was once thought to be a variety of southern red oak, cherrybark oak. The base does not have that "bell shaped" roundness that is typical of southern red oak. The Doc still takes the cake, though . We'll stamp'er red oak, good enough. You must be a lumper . A lump er a bump on a log. Maybe even a knothole. Well, I do not mind being corrected, but, if it was once thought to be cherrybark oak, what's it thought to be now? Back when I was in school, Cherrybark oak was considered a variety of Southern Red oak. A while back, it was accorded species status. The distinctions between the two are very very small. You may be right, Danny, but that shape is not atypical of southern red oak in my experience. A three-lobed leaf is, however, atypical of cherrybark oak, at least from what I have seen. Not unheard of, but not typical. Which is why I think it's southern red. Page created in 0.874 seconds with 40 queries.